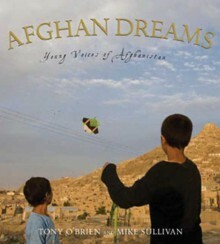 If the stories that come out of Afghanistan are ever to contain hope for the future, then the young people readers will meet in these pages are that hope. From street workers to female students in newly formed academies, children who work in family businesses, and pickpockets who steal from visiting photographers, these are the faces of young Afghanis who universally wish for peace in their neighborhoods, in their country, in their lifetimes.Award-winning photojournalist Tony O’Brien and filmmaker Mike Sullivan went to Afghanistan to interview and photograph children of a wide range of ages, from varied ethnic backgrounds, and with very different daily lives. As each one tells his or her story the reader is placed right in the middle of everyday life as it is lived by children in the midst of one of the world’s most enduringly conflict-ridden countries.